Crooked nose is a condition in which the shape of the nose is asymmetric and the nose appears as twisted. It is a nasal deformity, due to the involvement of aesthetic and functional elements of nose. The nasal septum is effected and as a result severe deformity occurs. The crooked nose may be normal in patients but the patients facing difficulty in breathing with crooked nose may have a septum deviated. When the septum is deviated, the airway is twisted due to crooked nose. As a result the air requirement cannot be fulfil because the airway is twisted. The nose is analyzed according to the face of patient, and it does not appear symmetric but appear twisted. The deviated nose may be due to unilateral collapse or may be true deviation. The septum of the nose separating the nostrils may also be deviated and the patient feel difficulty in breathing. The nostrils may get blocked on one side or both sides. Sinus infection can occur along with bleeding nose. The patient feel pain on face and headache also come along with it. 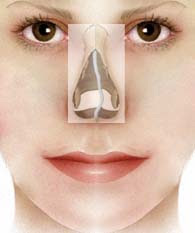 The crooked nose have many causes behind it and the most common one is trauma. As fracture of nasal bones is the most common and leading cause behind crooked nose. Even the treatment of the crooked nose after trauma cannot be considered successful. The external trauma may lead to the deviation of septum and as a result the external and internal valve may collapse. Deviated nose may be genetic. As deformity during the growth of facial features in fetus. It may be secondary to some diseases like autoimmune diseases or immunological diseases. Connective tissue disease also lead towards crooked nose. To make the crooked nose straighten is the hardest task ever. Before starting the surgery, a proper nasal framework is made to work on. The surgery performed to straighten the nose is known as Rhinoplasty. In Rhinoplasty, the patient have to take anesthesia, then an incision is made and reshape the structure of nose according to the framework designed. After that the septum which is deviated made aligned or straight. After completion, the incision is closed and bandaged. After the removal of the bandage, the difference can be clearly seen in the structure of nose. Lance bass, Patrick Dempsey, Shia labeouf, Zac efron, Bruce Jenner, Ryan sea crest and many more like them.